Description: Unique Silk Road tour offers you the opportunity to see the splendor of Uzbekistan, mountains and nomadic life of Kyrgyzstan and Famous Sunday Market in Kashgar, China! Arrival in Tashkent - every Saturday - to get opportunity of visiting famous Sunday Market in Kashgar - China! Arrival to Tashkent – the capital of Uzbekistan. Meet and transfer to the hotel. Overnight at hotel. After breakfast transfer to the airport for morning flight to Urgench by HY-1051 (07:00-08:40). Meet at the airport and drive to Khiva (30 km). Lunch. Afternoon city tour in Khiva. Visit Ichan-Kala architectural complex (12-19th c.), the Residence of the last Khan, including the Ismail Khodja Mausoleum, Mohammed Amin Khan madrassah, Kunya-Ark (16-17th c.), Kalta Minor Tower, Tash-Hauli (19th c.), necropolis of Pahlavan Mahmud (14-18th c.), and Djuma Mosque (10th c.). Dinner. Overnight at hotel. After breakfast drive to Bukhara through the desert along the Silk Road. Lunchbox en route. Arrive in Bukhara. Transfer to the hotel to have some rest and overnight. Breakfast. 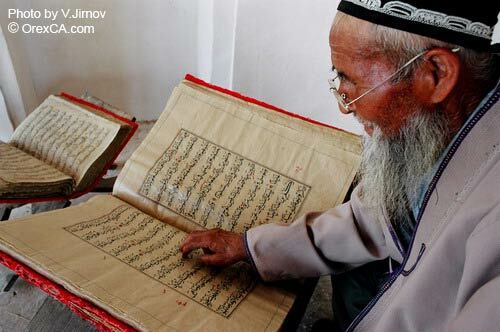 Full day city tour in Bukhara. 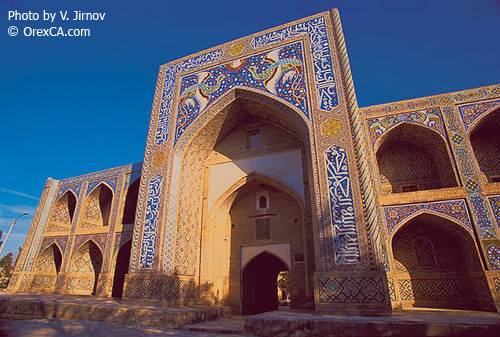 Visit mausoleum of the Samanids - the most ancient brick building in Central Asia, a masterpiece of world architecture (9-10th c.), the mausoleum of Chashma Ayub that belongs to esteemed "places of trace" left by saints (14th c). The legend says that once the bible prophet Job (Ayub) visited this place. Visit to the museums of Imam Al Bukhari and "The Museum of Water". Bolo-Houz Mosque - the only monument of medieval Bukhara (beg. of 20th c), Ark - the center of Bukhara statehood (4th c BC), silk carpet shops, complex Poi Kalon ("Beneath the Great"): Kalyan Minaret - the main symbol of sacred Bukhara that symbolized authority and power of spiritual governors. (12th c), Kalyan Mosque - its area of 130 x 80 m surpasses Bibi-Khanym mosque in Samarkand, Miri Arab Madrassah - active madrassah is one of the most esteemed spiritual Islamic universities (16th c), Taki Zargaron - the dome of jewelers (15-16th cc), Ulugbeg Madrassah - one of the 3 madrassahs constructed by grandson of Tamerlan - Ulugbeg (15th c), Abdulaziz-khan Madrassah - a traditional madrassah with 2 floors of hudjras and a mosque on the central axis ( mid. of 17th c), Tim of Abdullah-Khan madrassah (1588-1590), atlas shops, Magoki-Attari Mosque - the most ancient mosque in Bukhara (12th c) is considered a masterpiece of Bukhara architecture, Khanaka and madrassah of Nadir Divan-Beghi - a massive rectangular structure that was a place for the refuge and meditation of Sufis (17th c), Kukeldash Madrassah (16th c) - one of the biggest Bukhara madrassah, Lyabi-Hauz ensemble - the largest artificial reservoir of medieval Bukhara - is very popular among travelers (14-17th cc), Chor Minor ("Four minarets") is an unusual madrassah built by Caliph Niyazkul (18th c). Drive to Samarkand. Upon arrival transfer to the hotel. Overnigh at hotel. Breakfast. Half day sightseeing in Legendary Samarkand. Visit Registan Square: Medreseh Ulughbek (15th c.), Medreseh Shir-Dor (17th c.), Medreseh Tilla-Kori (17th c.), Gur Emir Mausoleum (14-15th cc. ), Bibi-Khanym, marketplace, Architectural complex Shahi-Zinda (11-15th c.), Ulughbek Observatory. Drive to Fergana Valley via Tashkent and Kokand cities. Upon arrival transfer to the hotel. Overnight at hotel. Drive to the Uzbek-Kyrgeyz border “Dostlik”. Meet the guests at the border, and transfer to Osh guest house. After lunch, city tour. Visit Holly Mountain, Babur’s Mausoleum and Silk Road Museum. Visit Osh Bazaar (out door market). Overnight at the guest house. Breakfast at hotel. Lunch at the cafй. Dinner in the guest house. Drive to Sary Tash village. Picnic lunch on the way. Upon arrival accommodation at the guest house/yurts. Dinner. Overnight in Sary-Tash. Breakfast at the guest house. Lunch at the cafe. Dinner in Yurt or at the guest house. Drive to the Kyrgyz-China border Irkeshtam (100 km). Meet the guests with driver and guide. Proceed to Kashgar. Overnight at hotel. Breakfast at the guest house. Lunch en-route. Dinner. City tour: visit the Grand Moosque, Abak-Hojais Tomb and handicraft center. Old towns and small lane of Kashgar. Overnight at hotel. Visit to Sunday Market. Afternoon free time. Dinner. Overnight at hotel. Drive to the China-Kyrgyz border Irkeshtam (100km). Meet the guests with guide and transport. Proceed to Say-Tash. Lunch en-route. Upon arrival transfer to the guest house/yurts. Dinner. Overnight at the guest house/yurts. Breakfast. Lunch en-route/lunch-box. Dinner at the guset house/in yurt. Drive to the Uzbek-Kyrgyz border “Dustlik” via Osh. Drive to Fergana Valley. Upon arrival transfer to the hotel. Overnight at hotel. After breakfast drive to Margilan city - visits to the ceramic workshop of Rustam Usmanov and the Yodgorlik silk factory, visit a Rishtan pottery workshop. Kokand City tour: Palace of Khudoyar-khan (1870), Gishtlik Mosque (1913), Djami Mosque and Minaret (1809-1812), Kamol-Kazy Madrasseh (middle of the 19th c.), Mulkabad Mosque (1913), Miyen-Hazrat Madrasseh (the end of the 18th c.), Dahman-Shakhon and Madirakhan Necropolis (the beginning of the 19th c.). Arrival in Tashkent. Overnight at hotel. Breakfast. Half day sightseeing in Tashkent. Visit Independence square, Navoi Theatre square, Barak-Khan Madrasah, The Kaffal-Shashi Mausoleum (15th c), Kukaldesh Madrasah (16th c), Djuma mosque (9th c). After sightseeing transfer to the airport for departure flight and see off the Guests. Good bye to the wonderful land, back to monotony with the intention of returning. 1. The price given is subject to change, according to some amendments. 2. Please note that road is not good in the areas between Osh - Sary Tash. 3. Accommodation in Sary Tash is very basic. 4. Borders "Irkeshtam" and "Torugart" (Kyrgyzstan-China border) are closed on Saturdays, Sundays and some national festives. 5. Please note that you should advise us beforehand where you will get your visas (otherwise we will give you our recommendations). 6. If you need visa support letters for Uzbekistan, Kyrgyzstan & China we will arrange it. Please inform. 7. Please advise arrival & departure flights. We can adjust the program accordingly.